As IPL 2017 kicks off today with Afghanistan’s making a debut through Rashid Khan and record breaker in Auction, Tymal Mills playing, Sunrisers will bat after losing the toss in the first match of IPL 2017 where both teams are captained by Aussie Mates, Warner and Watson. SRH and RCH have played 9 matches against each other. At group stage they won 4 each, but in the only match of PlayOff Sunrisers edged past Royal Challengers Bangalore in IPL 2016 final in the high scoring game where both teams scored 200+ runs. While the big trio of RCB, Kohli, Gayle and AB de Villiers have taken turns to exhibit their talent, its SRH captain David Warner who has been very consistent against RCB and often being the key wicket in deciding the results. Will Gayle alone help Watson surprise the Sunrisers at Hyderabad? Or Will Warner’s XI start campaign with an expected win against the weak RCB! Sunrisers have played 68 matches in 4 editions, winning 37 and losing 31, the most important being the win in IPL 2016 final. They have already reached PlayOff twice in 4 editions. Will it be third time top four finish in IPL 2017! RCB has played 142 matches in 9 editions, being the only team to finish Runners up thrice without winning even once. They have transformed a long way from their previous impression of being the test team of IPL to being the big scoring team in the last few editions. They have won 72 and lost 68 matches in last 9 editions. 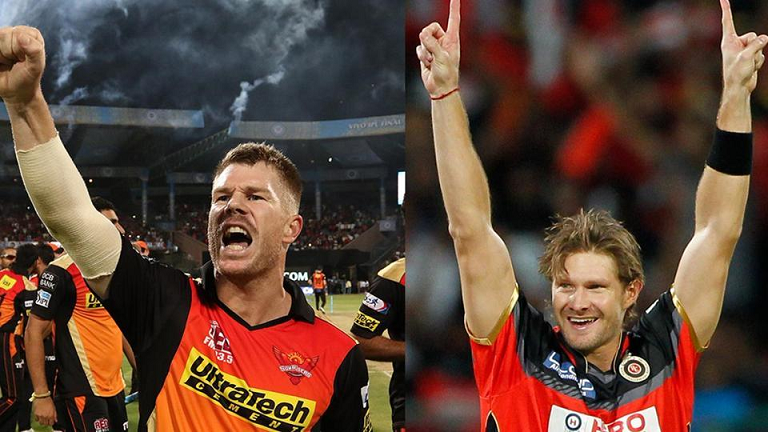 Sunrisers Hyderabad (SRH) and Bangalore rivalry has been more of a home advantage. Sunrisers took 5-4 lead in their rivalry when they became IPL 2016 champion defeating RCB, who failed to be the champion for the third time. Ben Cutting in the company of their only superstar captain Warner helped Sunrisers prevail over RCB, the team of superstars that had Shane Watson apart from the ripper trio of captain Kohli, AB de Villiers and Gayle. Today as they play the inaugural match of 10th edition at home, defending champion sunrisers look in a more comfortable position to start IPL 2016 campaign with a win as compared to the visitors from Bangalore, who are hit by injuries of top players. In the last season, they played three matches and all were high scoring. Gayle (1) was bowled by Bhunveswar in the second over of the game but Kohli (75) and Player of the Match AB de Villiers (82) added 157 runs in 14.3 overs to get home team safe whereas Sarfraz Khan’s 10-ball unbeated 35 just made the total untouchable. Sunrisers were in the game till captain Warner (58) played. After that Ashish Reddy (32) and Karn Sharma (26*) made the inevitable loss look like a respectable won as RCB won by 45 runs. Player of the match captain Warner’s 92, Williamson’s 50 and Henriques 14-ball 31 helped the hosts score above par total at Hyderabad where 160 was considered a defendable score. Gayle did not play but Kohli (14), AB de Villiers (47) and Shane Watson (2) were not allowed to shine. KL Rahul (51 in 28) was the only half-centurion for RCB. SRH won comfortably. Both the teams finished their run-making season with a mutual feast where Sunrisers emerged winner by just 8 runs in a final where Sunrisers scored 208/7 but couldn’t breathe easy untill the last over as RCB scored 200/7 in 20 overs. For SRH David Warner’s 69, Ben Cutting’s unbeaten 39 and Yuvraj’s 38 were the key factors while for RCB openers Gayle (76) and Kohli (54) almost won the match by adding 114 in 10.3 overs. But, then SRH bowlers somehow managed to control others.